since releace 1.0, it can be really hard to drive. there are 2 situaions when driving in third person view is very frustrating. Because of the trees/leafs, you can't always see where you are driving to. When the camera is placed behind the vehicle, there are often trees/leafs in the view, so just can't see what is in front of the vehicle. because of that I often get stuck because of rocks, resources or other trees right in front of the vehicle. I really love the new feature of mounting a drill at the front. when I explore a planet i drive around and whenever there is a "wall" in my way, I just drill through. Often I want to drill up to a platform, to get a better view. To drill up, I have to lower my camera position. That means I can't see anything in front of my vehicle, because the camera is now right behind or even under/in my vehicle. the main problem is, you can't see holes in front of the vehicle and just fall down. very frustrating if you just want to explore the surface. 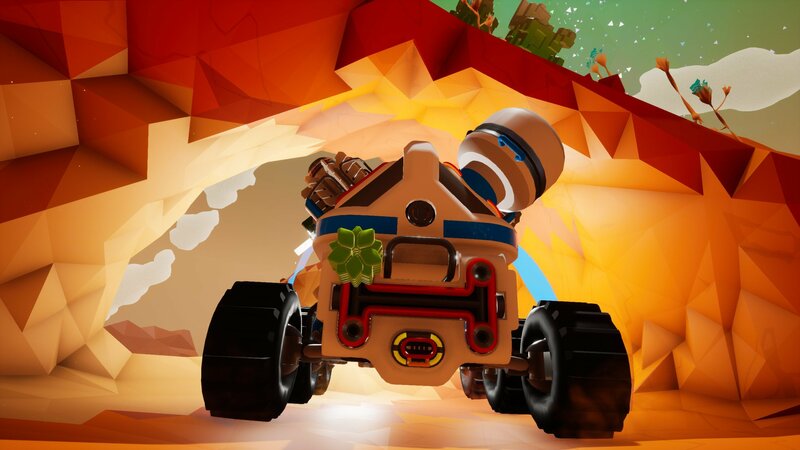 It would be really nice, if you would allow first person view just in vehicles/rovers. because we are in a vehicle, we don't see the backpack anyway. so not seeing the backpack isn't an argument in this situation. to make driving even better, you could use the small dashboard of the rover seat, with a load indicator, a compass and a gradiometer . that way it would be an awesome experience driving around in an rover. of cource first person should be optional and you can always change between first and third person view. I've attached an screenshot, while driving/digging up in a large rover. as you can see, to dig up, I have to place the camera very low and can't see what is right in front of my rover. if I attach a second large rover, then the camera would be right in or under the secont rover, which is even more difficult to drive. You listed all good ideas to fix tangible issues. It happened many times to me to drive & dig and to fall into a hole becasue I'm literally watching the back of the rover while I'm doing it. To avoid this you have to frantically go 1 meter and rotate in multiple direction the view to pick a good spot to look at that is not occupied by the rover or the above terrain ceiling. In these situations is also very hard to detect the drill's digging angle, if you want to dig upward, you have to right click and pull up the mouse in an awkard orientation so that you basically watch the bottom-rear of the rover (the rear cable plug area) and in no way you're looking where you're diggin into. To fix this I thin that are required other control to adjust the drill's angle, such as maybe the UP/DOWN arrows or PGup/PGdn or whatever. This would be a great addition to the game if they would do so. Personally i think you should be allowed a FPV regardless of being in a vehicle or normal giving players a "HUD" when in FPV that displays the essentials such as oxygen, compass and maybe indicators of the first and second gadget slots with either a green light for on/active and red for off/inactive (for tethers it would just display a number by it). It would be useful for digging as well as it will dig according to where you place the center of your screen if your digging down/up or forward. And to change view it would be the zoom button (what ever button is used to change the zoom distance that is) having a 4th zoom which would be the FPV.